This project requires working with a jigsaw but don’t get scared – it is easy and as you can see with the pic if you mess up a little it still looks cool. Cut a twelve inch circle (you can buy this from Micheal’s or Hobby Lobby). Next cut the carrot for the nose. Next – freestyle cut a hat – use the hat in the picture for an example. Bottom part of hat should be at least ten inches wide. Paint hat black. Paint head white and carrot orange. When dry you can roughen all fronts with fine sand paper. This gives it a rustic worn appearance. Paint on cheeks with pink. Let dry. Using a sharpie marker add numbers, mouth, eyes. With white paint add the text “Days Til Christmas” on his hat. With the sharpie marker make ridges in carrot. Use a nut and bolt that is just long enough to go through carrot into the back side making sure to add to washers between carrot and face. Epoxy the hat to the head. For additional security use small screws and drill from the back to front to hold hat on. At this time you also want to make a hanger on the back which you can buy already created or you can use wire around the house. Attach hanger on with screw from the back making sure to get it in the middle of the head. With Sharpie marker make numbers 24 – 1 going clockwise. You may want to add at least one light spray of polyurethane to keep in good shape. Hang and let your kids have a great time moving the carrot to a new day while they wait for Santa. 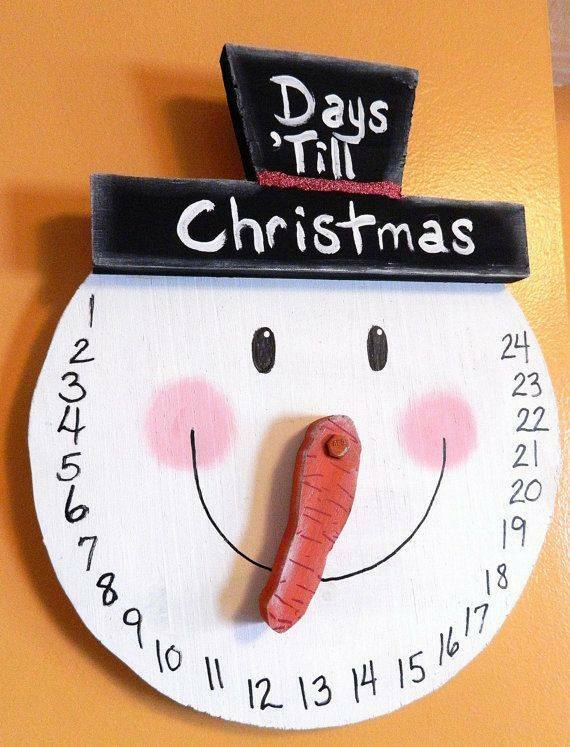 This entry was posted in Crafts ~ DIY ~ Projects, ~Christmas and tagged 1, 24, advent, Carrot, cheeks, countdown, days, eyes, face, hat, man, men, smile, snow, til, xmas, ~Christmas. Bookmark the permalink.